The Hamam (bath-house) was built in the XVIII by Haji Agha Mikayil from Shemakhy, on the south-west of the Icherisheher in one of the main streets, Kichik Qala street. The area where it is located is known in folk etymology a "bath keepers'" community (hamachilar mahalasi). The hamam is entered from Kichik Qala street. The interior of the building is distinct among other hamams for its large space (spaciousness). Cloakroom and bath-rooms are square-shaped. Due to the four central pillars, the premises form a large composition. 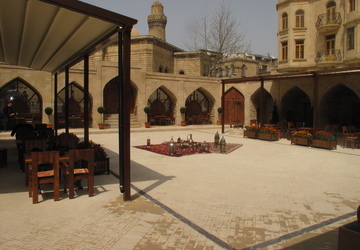 Architectural composition of the hamam is expressed with pointed arches, cupolas, domes divided by proportional tiers. Attractive volumes of domes dominating over strong façade and stone made following the vernacular architectural traditions have formed the basis of the hamam. A chimneystack of peculiar form is boldly silhouetted above the building. The monument is incorporated into the southern-east town civil system.